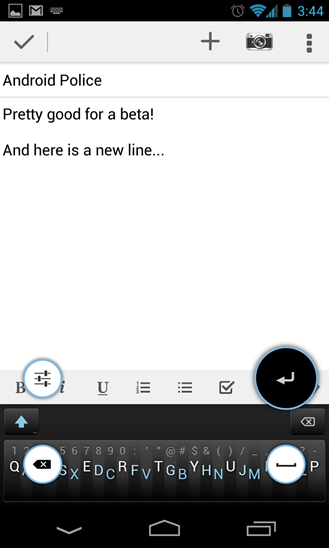 The beta app has been launched for IndieGoGo backers in Google Play, exactly as promised. Let's see if it lives up to the hype. 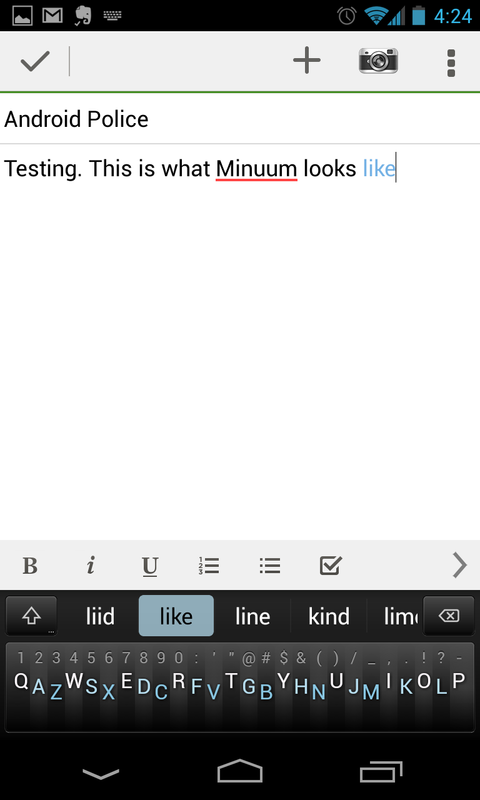 When you get into a text field, Minuum pops up like any other keyboard would, but it doesn't eat up your screen. Instead, you get a small strip of compressed letters 240 pixels tall. If you look, you'll notice that it's a staggered QWERTY layout that's been squished. Above the letters are an assortment of commonly used numbers and symbols. 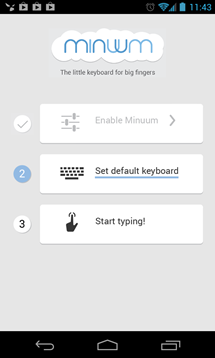 Minuum is about keeping your screen real estate by utilizing powerful predictive technologies. 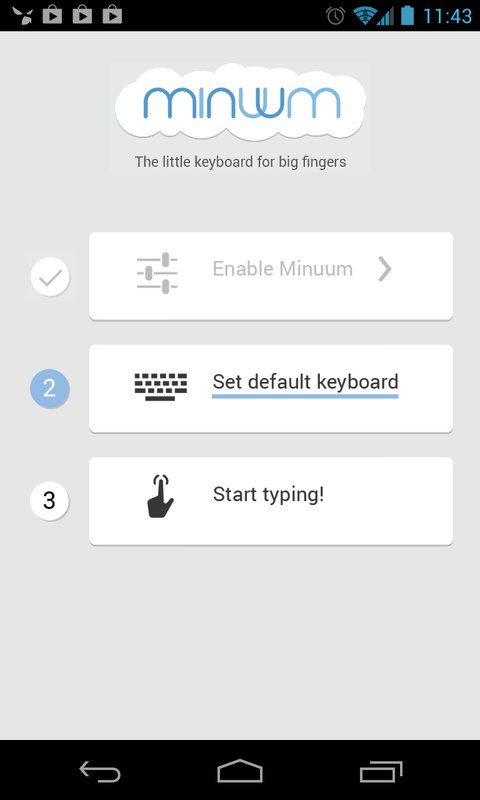 It's the same basic tenet guiding the development of Fleksy, another beta keyboard I looked at recently. Flesky relies on muscle memory to have you tap at invisible keys, but Minuum throws all that out the window. The keys aren't where you expect them to be, but they're almost where you expect. All you have to do is start pressing buttons. As you type, your finger will land on multiple letters – it would be impossible to hit just one. Minuum takes its best guess, and starts actively altering letters as you go. The suggestion bar right above the keys is where you can look to see what you have so far. Minuum highlights its best guess, and places what you've actually typed to the left. Other guesses are to the right in the suggestion bar. Okay, so there's a lot of tapping. That's easy to wrap your mind around, but things get more interesting when you get to the swiping gestures. You get a space by swiping left to right. Do the opposite for backspace. To select specific letters in an unrecognized word, tap and drag upward to get a magnified interface. This is also how you access the top row of numbers and symbols. If you long-press and drag to the side, that pulls up some "hot corner" shortcuts for enter, space, settings, and backspace. The shift button in the suggestion bar is also a long-press shortcut to the alternative symbol keyboard and settings. The floating mode from the above video doesn't appear to be part of the current release, but it might just be hidden. Put all this together, and it's Minuum. It definitely takes up less space than other keyboards, but that's only part of the equation. The first sentence I typed on Minuum made my jaw drop. I don't want to be hyperbolic, but I was genuinely shocked. There is something incredible going on with this keyboard's predictive algorithms, because it's really good. The location of your presses might have only a loose association to the letters you're trying to type, but this app usually guesses correctly. 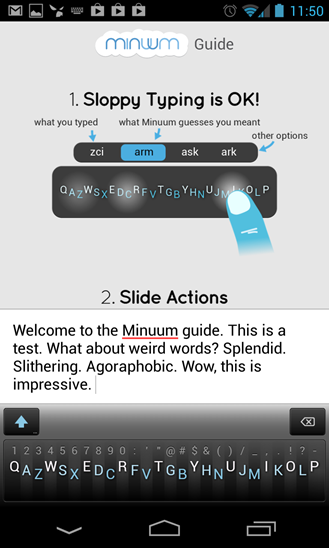 The longer I use Minuum, the more I'm learning to trust it. You can get into a rhythm of tapping and swiping to insert space. I feel like I can actually look at my screen while inputting text rather than my fingers. 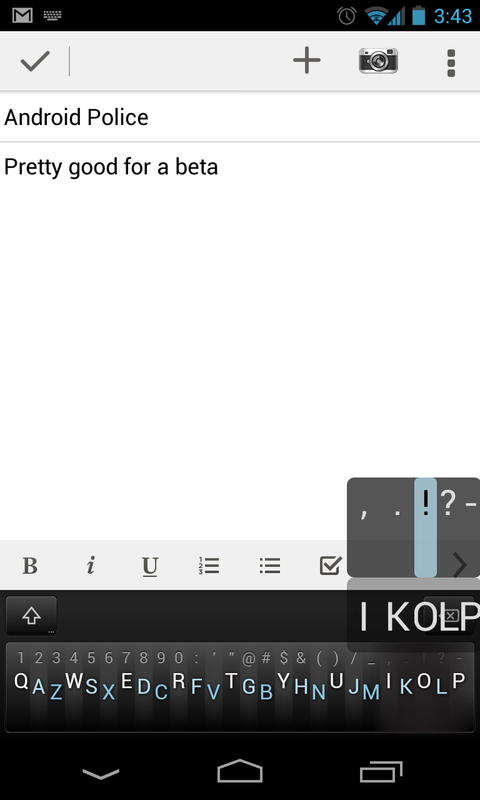 This is the closest I've gotten to reliable touch-typing on a smartphone. 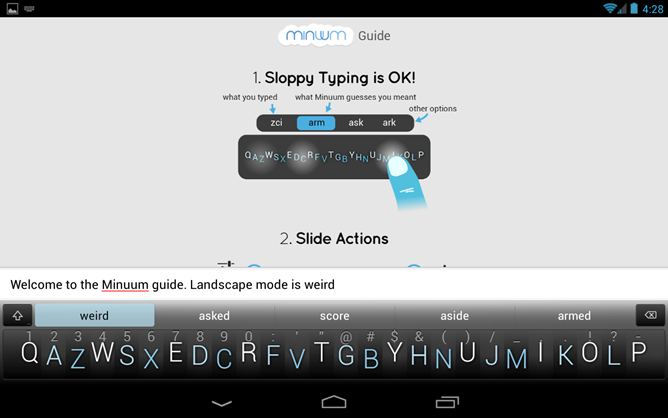 The bottom line here is that Minuum inputs dictionary words as well as any keyboard I've ever used. 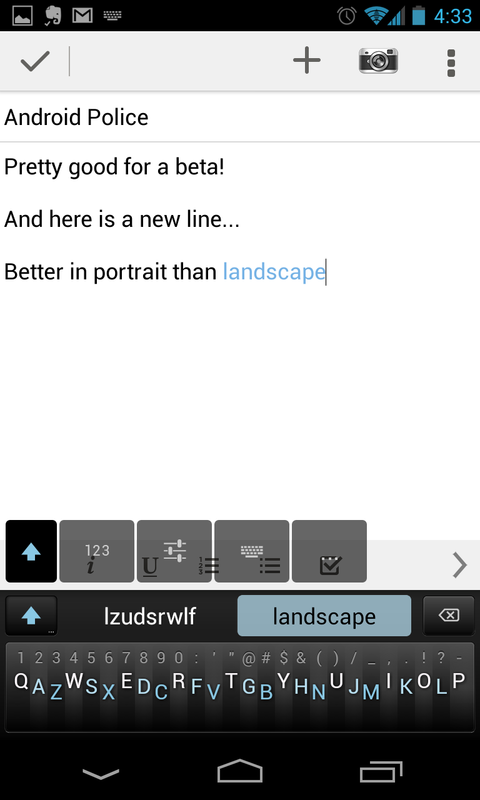 I think the hardest part of adjusting to Minuum is getting used to swiping for spaces and backspaces. It still trips me up from time to time because I have such strong muscle memory to tap the space bar. I expected the squashed keyboard layout would get to me, but once you stop stressing over it, it's fine. One strange thing – Minuum gets considerably less usable in landscape mode. Everything is still very close together, but you have to reach so much farther. 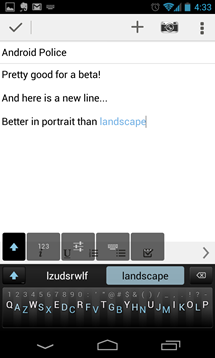 It's basically amplifying the issues all keyboard interfaces have in landscape mode. It would be a different story if the floating UI shown off in the video was present. The place a lot of wacky keyboards fall down is when you need to enter a password, name, or some other non-dictionary word. It's usually a hassle to move away from a highly-automated system to a more manual one for those events. 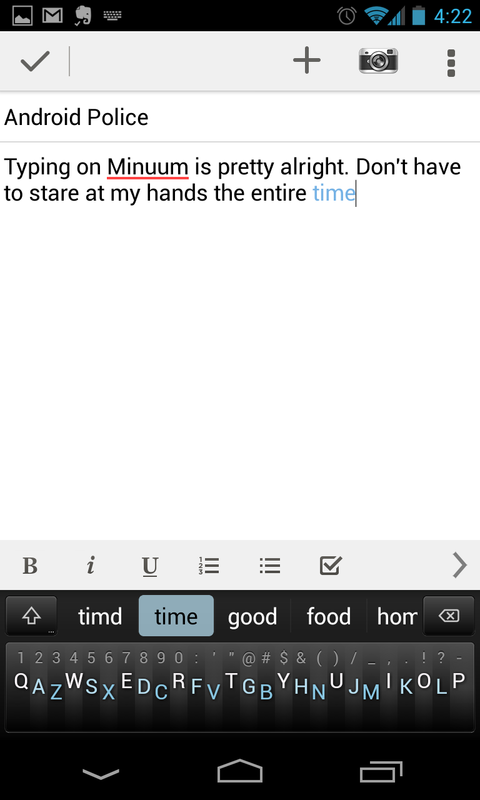 Minuum handles it better than most, but it's still not ideal. The magnification long-press works very well – just press in the general vicinity of the desired letter, number, or symbol, and drag up through the enlarged pop up. It's very intuitive, and I like this method compared to some other apps. Although, it's still slower in this respect than full-size QWERTY keyboards. So to answer the original question: yes, Minuum does work. In fact, it works really well. This is the first release – 1.0 of a beta product. It's actually rather amazing when you look at it like that. I love having more screen real estate, and even the slow-downs from inputting unrecognized words aren't that bad. Even though there are some rough edges to be smoothed, the developers have done something great here. I have high hopes for this product going forward. The Google Play link below will not work if you aren't in the supporter beta program.